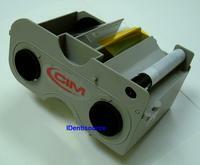 Genuine CIM C278044720 cartridge with 6 panel YMCKOK color ribbon 200 images, plus cleaning roll. For Sunlight K3 printers. Important Notice: CIM re-designed the cores of their ribbons; they used to have grooved cores but now have smooth cores. To use the ribbons now being produced, your must purchase the CIM CD05642 Grooved to Smooth Core Adapter Kit , (only one kit per printer is needed) that works with all 20 mm core ribbons.